The independent transport videos cameras have returned to Hong Kong Island to record the bus and tram transport scene in late 2009. As in previous visits we have captured the action for you to enjoy! This time we start off at the Central Bus Station located at the new Central Ferry Pier where the Star Ferries operate from. Here to open top tours buses start their tours. New this time are the ‘Rickshaw’ open top tours operated by converted VA series Volvo Olympians from the New World First Bus fleet, we see them stating their journeys. From here we move a short distance to record the comings and goings of mostly Citybus vehicles at the Exchange Square Bus Station. Just outside here is the busy Connaught Road which has vehicles from the three major fleets, NWFB, Citybus and KMB. Our next location is the Macau Ferry Bus Station as well as the busy streets of Sheung Wan. Here we record the buses as well as the famous Hong Kong trams as they turn at Western Market. Along from here we film on Des Voeux Road as we make our way to Queensway at Central. The next stop is Wan Chai at both the bus station and Hennessy Road. We then continue our journey eastwards to North Point before arriving at Shau Kei Wan for both bus and tram action on Shau Kei Wan Road. Siu Sai Wan is our next location for you to enjoy the action. We then take a bus ride. From Central we board Citybus Volvo Olympian 999 (HT 5860) to the south of the island and visit the busy town of Aberdeen. There is footage at the bus station as well as in the streets. Also some unusual shots of Citybus’s Aberdeen bus depot taken from Ap Lei Chau Bridge. He we observe buses running into and out of the multi-storey depot. For the final shots of the visit we board another Citybus Volvo Olympian, this time 925 (GX 6728) to South Horizons Bus Station to record the action at this very busy location which features buses from all three major operators. 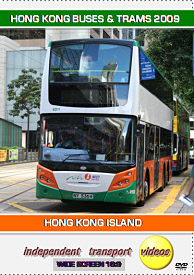 We hope you enjoy the buses and trams on Hong Kong Island, the first programme of our 2009 trilogy.